This week Venom gets a new start with Donny Cates and Ryan Stegman, and the Justice League head into space with No Justice! 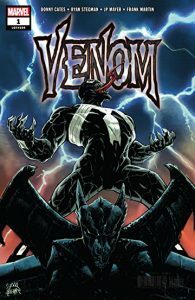 The Marvel relaunch train is gearing up, and after last week’s Avengers #1, we’ve now got the Lethal Protector himself, Venom, getting a brand new shiny #1. But like Earth’s Mightiest Heroes before him, the appeal of the creative team helps offset any quibbles one would have over the renumbering. 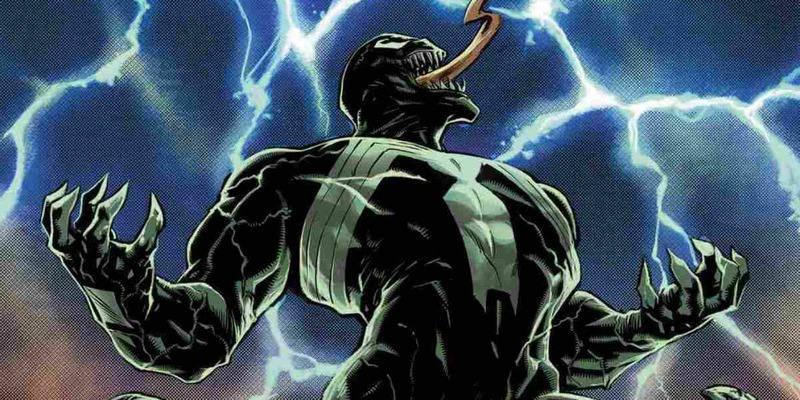 Rising star Donny Cates is at the writing table, and Marvel artist supreme Ryan Stegman is handling the art, which means that we’re in for a very different, and very cool, new take on Venom. Venom has been having nightmares. Not Eddie Brock, though. The symbiote is the being that’s having bad dreams in the dark. Plagued by visions of a monstrous creature that’s very similar to him, Brock is thrust into a mystery that goes back to almost the beginning of modern civilization. And when the symbiote refuses to respond to his commands when he’s out on patrol, it’s a problem that quickly becomes more and more dire as time goes on. After stellar runs on Thanos and Doctor Strange, the hype around Donny Cates coming onto this book is pretty large. Cates ably lives up to those demands though, and his script is teasing out some really interesting things about the symbiote and it’s connections to hosts. What’s surprising about this new series though is how much it feels like a horror comic as opposed to a superhero one. There’s certainly a lot of horror elements that can be gleamed from Venom, and going this way with the character actually leads to be a pretty cool and unique take that gives the character a brand new lease on life. Cates’ characterization of Brock and the symbiote isn’t anything new, but the premise behind this new series invigorates that relationship as well. When it comes to fantastic Marvel artists, Ryan Stegman is at the top of the list. A style that mimics Todd McFarlane and Mark Bagley, Stegman’s art is bombastic and full of motion, and like Cates’ script, it ends up being a surprisingly good fit for this book. I was curious how Stegman would handle a horror-themed Venom series, but I’m happy to report that he handles the script with ease. Stegman is known for some delays and inability to stay on books for long, so hopefully there’s enough issues in the can where that won’ be a problem for Venom. Venom #1 is a prime example of what I’m hoping Marvel’s “Fresh Start” initiative will be: a new spin on a character that reinvigorates them. I never thought of doing a horror book for Venom, but it works really well, and helps to make his book stand out from the other Spidey titles on the rack. It’s also continuing the hot streak that Donny Cates is on, which is a plus. Here’s hoping for big things from not only this title, but for the rest of Marvel’s new line too. Now that the events of Metal have wrapped, you’d think the Justice League and the rest of the heroes of the DC universe would get some much needed R&R. Well, unfortunately for them they aren’t getting it just yet. 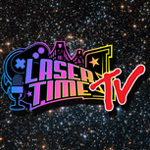 In fact, the consequences of that event have become the focus point of No Justice, the weekly mini-event that will serve as the launching point for the rest of DC’s plans for the summer. With a writing team of Scott Snyder, James Tynion IV, and Joshua Williamson, and with art from Francis Manapul, the opening issue of No Justice is definitely the awesome start the series deserves. With the Source Wall now cracked open, the DC universe is now open to all kinds of attacks from the unknown creatures that wait on the other side. After an attack from Brainiac, the Justice League soon realizes that Brainiac has come to warn them of a threat so large that they must team up with him and a bunch of other villains in order to stop it. Combining a huge mix of characters together, many that would make you do a double take at the roster (even Starro the Conquerer makes the cut), the teams set out to investigate, but what they may find will make them regret their decisions. With three of their strongest writers on the book, it’s easy to believe that this issue is pretty great. However, any worries that the three might make for an overcrowded narrative are quickly forgotten, as Snyder, Tynion, and Williamson all work extremely well together. This opening issue starts off with some pretty big stakes and doesn’t let up, with a wide range of characters and a huge epic scope to this series, but it’s also pretty fun as well. Snyder, Williamson, and Tynion IV all have a good time having the heroes bounce off of their bad guy teammates, and there’s even a pretty ingenious subplot involving the Suicide Squad’s Amanda Waller that will make DC fans grin. Francis Manapul made a big name for himself on the New 52 run of The Flash, and while he doesn’t offer up any crazy page layouts in this issue, he still does a great job of capturing the scope of this event. From the opening pages with the Green Lantern Corps surveying the Source Wall to the Justice League’s fight with Brainiac, Manapul’s art is simply stellar, and I can’t wait to see what he brings to the next installments of this event. 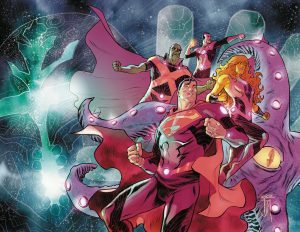 No Justice is setting up some pretty big things for the future of the DC Universe, and I’m really intrigued to see where it goes. While I don’t think this is quite as new-reader friendly as DC is intending, I also don’t think it’s completely impenetrable. Snyder, Williamson, and Tynion offer enough to get you up to speed, and issues of Metal are still regularly available at many local comic shops. If you’re looking to see how the DC universe is going to look this Summer, this is the book to check out.